Yet the latest movie based on a series of novels that is due out soon. I'll try to keep updated contests and screenings that I come across on this page as I find them. So check back often. 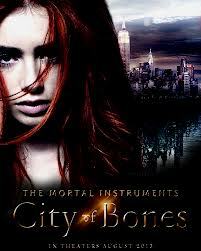 Details: Enter to win a pair of passes to the advance screening of THE MORTAL INSTRUMENTS: CITY OF BONES. The screening will take place onMonday, August 19 at 6:30 p.m. at a theater in Manhattan. Details: Grand Prize drawing for a private screening of The Mortal Instruments: City of Bones for you and 100 friends – right in your hometown and $200 Michael's gift card! Details: Win screening passes, including one Grand Prize winner will get a $50 Michael's gift card as well a $50 Book A Millions gift card! Details: Gofobo Code available in below link. All claimed already, but check it often as sometimes people cancel their RSVP if they're not able to make it. Details: Grand Prize drawing for a private screening of The Mortal Instruments: City of Bones for you and 100 friends – right in your hometown.